ACT Forklift: Protecting Facility Investments - What Is Your Strategy? Protecting Facility Investments - What Is Your Strategy? I really enjoy my visits with a prospect or customer and getting a tour of the facility. I am encouraged by those tour leaders and their excitement for completed, current, and future projects. ACT works hard to keep our facilities up to date, safe, and clean. There are ways for us to protect our investment, and most are simple and low cost items. But it takes a strategy and plan to complete the investment protection part of a project. I believe a small investment in protection systems continues to promote the idea of the project while protecting the project from damage and extra costs. Let's say you have a new door installed that connects parts of your facility. Don't let all the expense for the project go to the installation and equipment. Set up some protection for that investment. 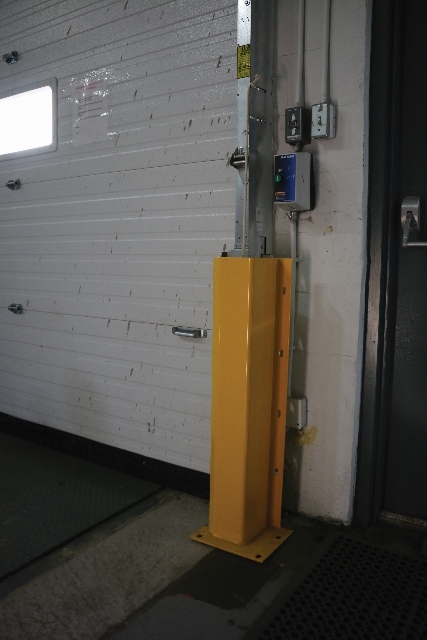 The picture above shows a yellow overhead door track protector and this device calls attention to the door, protects the track, and enhances the initial project while reducing maintenance costs for damage. Costs? Less than $100 for a 36" tall protector. How about the dock area? Let's say have a near miss accident due to early departure of a tractor/trailer. Your project to address the situation is to add a wheel chock program. 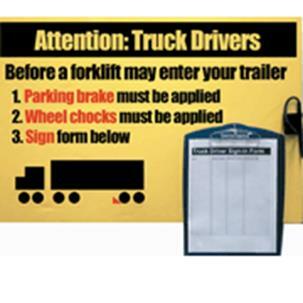 Add the wheel chocks as well as the signage and checklist to the dock area wall. Costs? $65. Confirm to associates and visitors your desire for a safe work environment. The list is endless, and that is why finding the right material handling equipment partner is so important. A simple facility review and tour can result in cost saving ideas that increase safety and OSHA compliance for your company. Let the material handling experts assist with ideas and brainstorming, and if the ideas are strong and value adding, then let them propose the project to your team. Thanks for the blog. You can get yourself Safety Training Courses Hamilton to prepare yourself and to get knowledge about all the safety measures.